than they do hamstrings (muscles on the back of the thigh). This exercise will strengthen the hamstrings to a high level and will help to eliminate muscle imbalances that can lead to injury. 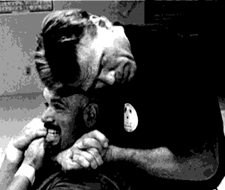 and it will help you lift an opponent up off the ground. Glute Ham Raises will strengthen your hamstrings and glutes like no other exercise. and will also lessen your chances of knee injuries and hamstring pulls. 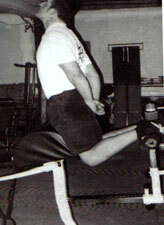 Here, J.P. Pocock is shown doing Glute Ham Raises on a Glute Ham Machine designed by Louie Simmons. This exercise was originally developed by Russian athletes who placed a gymnastics vaulting horse next to a set of wall bars that were very common in Russia. They rested their thighs on the vaulting horse and secured their heels under the wall bars. Then they performed the exercise as shown here. routinely did 60 reps to warm up. He also used 225 lbs. for 5 reps, a phenomenal feat. Curl yourself upright using your hamstrings and glutes. Notice that J.P.’s kneecaps are not contacting the pad. Also notice that the soles of his feet are in contact with the toe late. At the up position your thighs should almost be vertical to the ground. Keep your back straight throughout the movement. not the insertions which stabilize the joint. But once in awhile it might be useful for the sake of measurement. you are vulnerable to hamstring and knee injuries. But don’t despair. Glute Ham Raises are a big part of the solution. Be sure to place lots of padding under your knees since there will be pressure on your knee caps. until over time you don’t need your hands at all. 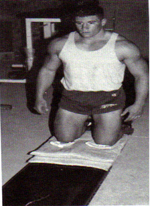 If the exercise is still too difficult, just concentrate on the lowering portion of the exercise. Push yourself up with your hands and lower yourself back down. Concentrate on resisting the downward movement with all you’ve got. and pretty soon you’ll be knocking out some serious reps without the use of your hands. on a mat while a partner holds your feet down. Again, be sure to use extra padding under your knees.